Your corporate data. It has a way of multiplying, increasing volumes of stored content exponentially every year. In fact, IDC estimates the overall volume of digital bits created, replicated and consumed across the United States will hit 6.6 zettabytes by 2020 - doubling in volume about every three years. That's a great deal of data and yet so much of it remains in the "dark". What is "dark data"? It's been defined by Gartner "as the information assets organisations collect, process and store during regular business activities, but generally fail to use for other purposes (for example, analytics, business relationships and direct monetising)". In other words, it's data that you are paying to store, protect and manage that isn't being efficiently utilised to improve the value of your business. Even worse, it may even contain content that puts your business at risk. CommVault has perfected methods to intelligently leverage stored content while managing it throughout its life cycle. 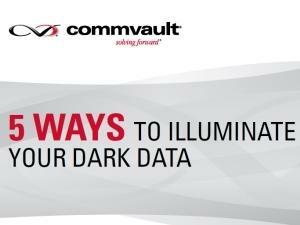 Here you'll see five ways CommVault Simpana 10 will help you better search, understand and govern the mountains of unstructured data - such as email - your organisation retains, illuminating your "dark data" to deliver more business value.